Blacklegged ticks can transmit Lyme disease bacteria into your bloodstream, and these bacteria are known as Borrelia. If Lyme disease isn’t detected or treated, you can experience serious health complications – including arthritis, mental confusion, and facial paralysis. So what you should do if you’re bitten by a blacklegged tick in an area where Lyme disease occurs (see the map below)? States in green have especially large populations of ticks that carry Lyme disease bacteria. 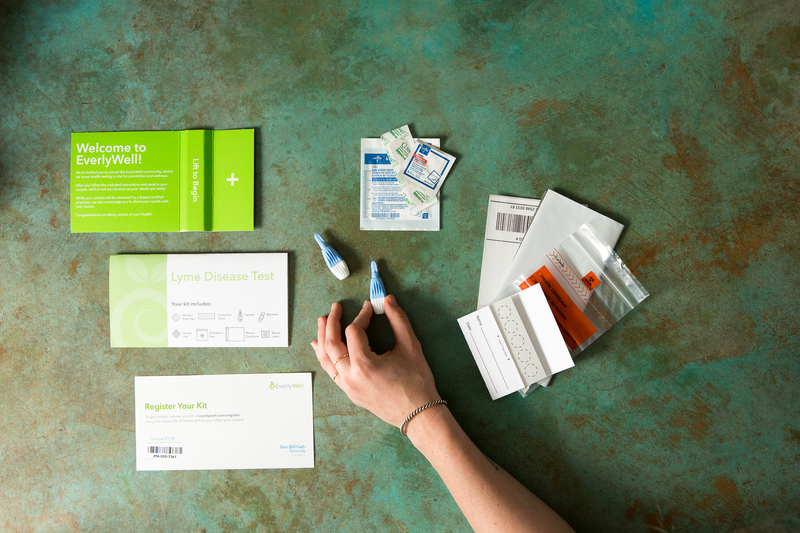 Here’s what to do – and if you’ve already been bitten and want to screen for Lyme disease, consider taking EverlyWell’s at-home Lyme Disease Test. This probably goes without saying, but the very first thing you should do is remove the tick from your body as soon as possible. Lyme disease bacteria – or Borrelia – live in the tick’s gut (if the tick is infected). So it takes some time for these bacteria to make their way to the tick’s mouthparts and into your bloodstream. The very first thing you should do is remove the tick from your body as soon as possible – using fine-tipped tweezers. Source: CDC.gov. Thus, the risk of Borrelia bacteria getting into your body increases significantly if the tick is attached to you for more than 24-36 hours . What’s the ideal way to remove a tick? Experts recommend using fine-tipped tweezers to gently grab the tick – “as close to the skin as possible” – before pulling it straight up with a steady, consistent pressure . Other methods – like rubbing gasoline or nail polish over the tick – are generally ineffective for quick removal and might even heighten the risk of a Lyme infection. Experts also discourage burning the tick because this can make the tick burst, possibly spreading fluids with Lyme bacteria around the bite . The tell-tale sign of Lyme disease is an expanding, circular skin rash at the site of the tick bite. The outer edges and center of the rash are typically red, with little redness in between . This can give the rash – which is seen in about 70% of people with a Lyme infection – a “bull’s-eye” or “target” appearance. 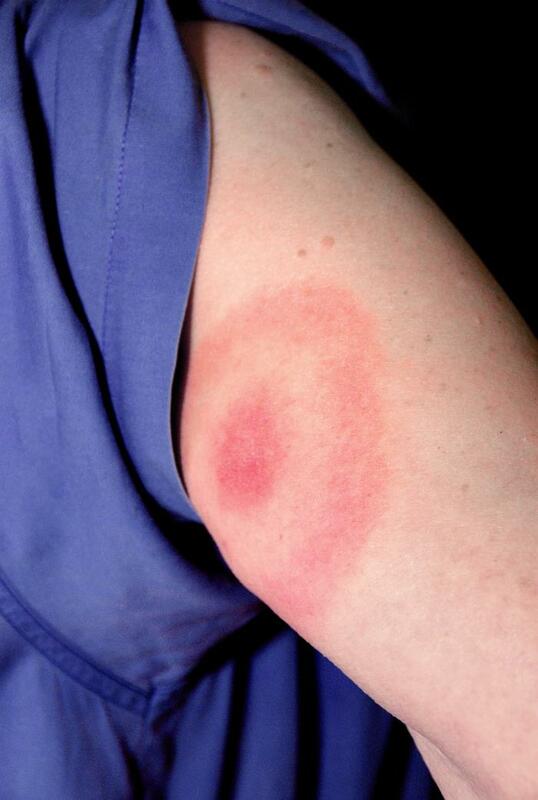 Image of a bull's-eye rash appearing on the upper arm. Source: CDC.gov. This rash typically begins within 30 days after the tick bite (on average, it first appears about 7 days after the bite) . As days and weeks pass, the Lyme bacteria steadily travel throughout the body and can cause other “bull’s-eye” rashes to appear. If you notice one – or more – of these rashes on your skin after a tick bite, seek medical attention as soon as possible. If you observe any of these symptoms, report them to your doctor to learn what should be done next. Your doctor may want you to take a blood test for Lyme disease. If you experience symptoms of Lyme disease, but not the bull's-eye rash, your doctor may want you to take a blood test for Lyme disease. Since these symptoms can take some time to show up , it’s not always easy to know if Lyme disease is the cause. In this case, taking an at-home Lyme Disease Test can help you determine if you have a Lyme infection and need treatment. If you’re bitten by a tick, remove it as soon as possible. This will lower the risk of Lyme disease. Remove the tick with fine-tipped tweezers. Don’t use gasoline or nail polish – or try to burn it off. If you spot a bull’s-eye rash on your skin – which usually develops within 30 days of the tick bite – get medical attention right away. If you experience other Lyme disease symptoms within 30 days of the tick bite, share this with your doctor. If you experience Lyme disease symptoms several weeks or months after the tick bite, consider testing for Lyme disease with EverlyWell’s at-home Lyme Disease Test – and talk with your doctor. 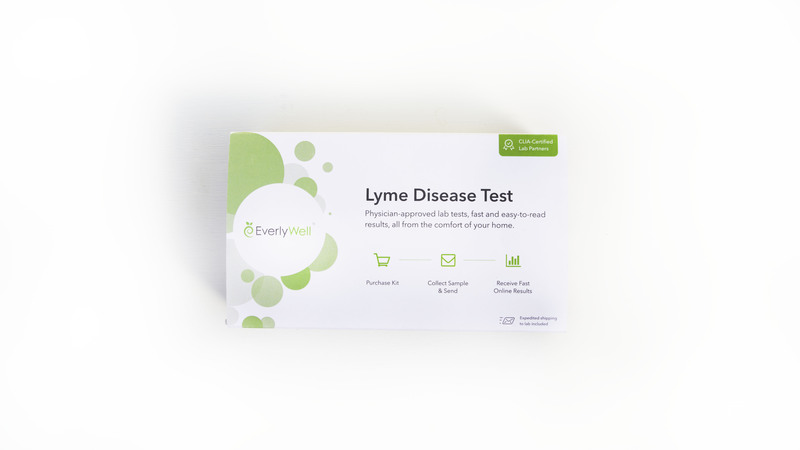 If you experience Lyme disease symptoms several weeks or months after the tick bite, consider testing for Lyme disease with EverlyWell’s at-home Lyme Disease Test.